Sir William Bot Review - Scam With an English Accent? One of our readers told us about a suspicious online opportunity called Sir William Bot, marketing itself as a software that can bring you millions of dollars. Can they be trusted? Is Sir William Bot a scam? Let’s find out in the Sir William Bot review. 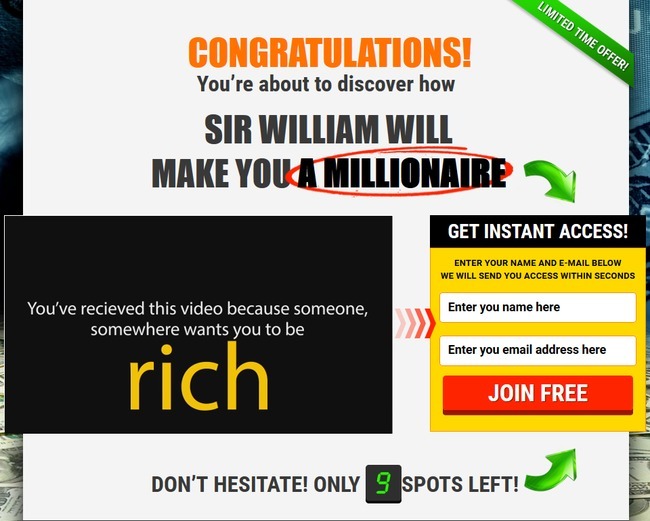 Sir William will make you a millionaire, and there are only 9 spots left.. or is it? Now, as soon as you enter Sir William Bot’s homepage at sirwilliambot.info, you are greeted with a “limited time offer” and a typical scam recipe – exaggerated claims and an embedded sales video. Check out the reviews of My Cash Bot by Dustin Crow and The Real Dream Maker by Kevin and you’ll notice the similarities. I’ve watched the entire sales video, and apart from the amusing English accent, there’s no useful information at all. All you get to hear is how Sir William Bot will make you a millionaire, and that the alleged owner of Sir William Bot, John Burley is so rich he doesn’t need your money. He wants to give it away for free so you can make money too. We’ll reveal below how John Burley earns money off you if you decide to sign up for Sir William Bot scam. Yes, Sir William Bot is nothing more than a binary trading software scam. To make sure everyone is on the same page, we’ll go through briefly how binary trading work. If you’ve traded binary options before, you can skip this segment. Binary options is basically trading reduced to its simplest form. You don’t have to read financial news or analyze complex market movements. With binary options, you only need to predict if the price of an asset will rise or fall after a short period of time, usually between 30 seconds to minutes. There can only be 2 outcomes – either you are right, or you are wrong (hence the name binary options). There is no middle ground. Even though it sounds extremely simple, profiting from it is a whole other matter. This is how binary options work – for instance, I predict that the price of gold market will rise 3 minutes from now, and I bet $50 on a 3-minute contract. When the time is up, and the market price is indeed higher, I earn a certain percentage of what I bet, let’s say 60% ($30). But if I’m wrong, I lose the entire $50 that I bet. As you can see, trading binary options is not that different from your average gambling. In most cases, people rely on pure luck and gut feelings trading binary options because there’s no good way to predict market movement in such a short period of time. Even if you manage a decent 50% win rate, you will still lose money due to the uneven winning vs losing payout (the difference in payout is how binary options brokers make money). How Does Sir William Bot Work? 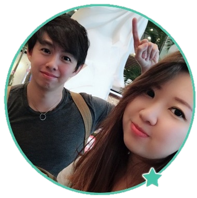 According to John Burley, trading binary options with Sir William Bot is extremely easy, because Sir William Bot will do all the hard work for you and choose the best trades for you. You don’t even have to make a single trading decision. All you need to do is to register for a broker account through them, deposit a sum of money, and let Sir William Bot trade your account and earn you BIG money. John Burley claims that Sir William Bot runs completely on autopilot and will make you a millionaire. Can you believe it? Looks like there will be a bunch of millionaires born from Sir William Bot alone! And that’s exactly what John Burley wants you to believe. The truth is, instead of turning you into a millionaire, you are turning John Burley into a millionaire by investing in his software and handing your hard-earned money to him and Sir William Bot scam. In the entire sales presentation of Sir William Bot, no mention was made at all regarding the risks that come with binary trading. Instead, Sir William Bot scam keeps telling you how rich you will become, and how much money they will make for you. Investing in financial instruments involves a high degree of risk and may not be suitable for all investors. Sir William Bot is not responsible for any losses related to use of its services or software. Unlike an actual performance record, stimulated results don’t represent actual trading (which means all the results presented to you in sales videos are not real). Why does Sir William Bot include such terms in their hidden earnings disclaimer? It’s used to protect themselves from legal actions when you lose all your money automating your trades with Sir William Bot. Despite the way they sugarcoat binary trading and the guarantees they provide in the sales materials, they will not be responsible when you lose all your money using Sir William Bot. Why Does John Burley Promote Sir William Bot? You may wonder why does John Burley goes through so much trouble to promote Sir William Bot and gives it away for free. Firstly, if you decide to sign up for a broker account through Sir William Bot sales page (which is an affiliate link), John Burley and the team behind Sir William Bot scam will earn a sum of referral fee when you make your first deposit. You will need to deposit a minimum of $250 into CTOption before you can automate your trades with Sir William Bot, and you can only use the software on broker accounts created through Sir William Bot sales page. Not only that, Sir William Bot will continue to make money off you over the long term, as they earn commission for every trade the software makes for you. The scary part is, Sir William Bot runs completely on autopilot. Your trading frequency and trade amounts are fully determined by the software, which means they can decide how much commissions to earn off you as long as your account is not depleted. John Burley will profit regardless of whether you make or lose money, while RISKING ONLY YOUR MONEY. Is Sir William Bot a Scam?